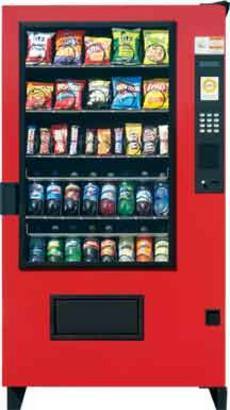 The Outsider is ideal for all your vending requirements outdoors. (weather proof, vandal proof, quad glazed, chilled machine. Will bolt down. The Outsider is a rugged outdoor vendor offering a choice of Snack and Visi-Combo (snack and bottled beverage) configurations. A heavy-gauge steel lock-cover, additional glass-front protection, and vandal panels add to all the other standard AMS features to make this merchandiser just what you need for the great outdoors. This machine offers all the features of the Visy Combo. Please Note: Picture shows 5 tray configuration, unit also available with 6 tray set-up. The High-Security-Outsider is available in snack and snack-drink combo.